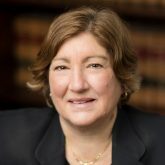 Susan has been practicing labor law with Sandulli Grace, PC since graduating from Northeastern University School of Law in 1984. While in law school, Susan was a coop student for the law firm: she and Alan Shapiro shared a basement office while Joe and Ken had lovely windowed space on the upper floors of a Beacon Hill townhouse. Although the firm has since relocated to downtown Boston, Joe still has the office with the best view. After all, we do believe in seniority office bidding. Before attending law school and moving to Boston, Susan spent five (5) years working in personnel and labor relations for the U.S. Labor Department in New York City. There she was involved in bargaining with the AFGE for Region 2 and Washington DC. Prior to her work at the Labor Department Susan was a VISTA volunteer working as a paralegal for legal services in Tacoma, Washington. Susan was raised in Coney Island, Brooklyn, USA where her Dad served on the New York City Council for over 20 years. Susan currently lives in Brookline, with her husband, labor arbitrator James Cooper. They have two children. Phoebe lives in New York City and works at NBC News. Will is in college. Susan has served on the Board of Directors for the YMCA Central branch, as Chair of the Board of Directors for the Advent School and on the Board of Directors of the AFL-CIO’s Lawyers Coordinating Committee. City of Lynn v Lynn Police Association, MCOP: Established that residency for police officers is subject to collective bargaining. Town of Chatham & MCOP: Arbitrator confirmed seniority shift bidding. City of Boston & BPPA: Arbitrator ordered the City to relocate ID Unit because of safety and health issues in the workplace. City of Lynn & MCOP: Arbitrator found that City violated agreement to repay officers if City accumulated sufficient funds. Arbitrator issued six-figure award. IBEW Local 1228 & Telemedia: Arbitrator agreed that increased co-pays and deductibles changed health care benefit and therefore violated contract. City of Boston & BPPA: Arbitrator found that City could not discipline officer for positive drug test when the test was given too soon after treatment to be valid. BPPA v. City of Boston – LRC holds that City illegally transferred bargaining unit work at Boston Housing Authority to Boston Municipal Police. Appeals Court affirms decision. Various MCOP locals – LRC compelled public employers to submit contract disputes to arbitration, despite absence of arbitration provision in collective bargaining agreements. Represented local in JLMC proceeding that awarded “just cause” protection. GOLDEN RULE – Give your client your undivided attention and fight like hell for what is right.